Bible. Old Testament. Psalms. Hebrew. [Psalter]. Paris: Robert Stephens, 1565. 11.5x8cm. Formally in the library of Francis Anthony Matignon (1753-1818); presented to William Bently (1759-1819) by Bishop Jean-Louis-Anne-Madeleine Lefebvre de Cheverus (1768-1836) after Matignon’s death. Gift of Bishop Cheverus, 1819. Although the relationship between the Boston Athenæum and its Protestant neighbors is well-documented, its longstanding association with the Roman Catholic Church is not as well known. The Library’s large collection of sermons, religious tracts, and biblical texts and commentaries contains a surprising number of titles on Roman Catholicism, based largely on the personal library of the first Catholic Bishop of Boston, John Cheverus. Jean Louis Anne Madeleine Lefebvre de Cheverus was born at Mayenne, France, on January 28, 1768. He was ordained on December 18, 1790 in the last public ordination in Paris before the revolution and appointed pastor of his native parish. As revolutionary fervor mounted in France, the young priest fled to England, narrowly escaping the massacre of the clergy, and several years later sailed to Boston at the invitation of his former professor, Abbé François Antione Matignon. He landed on October 3, 1796. Now calling himself John Cheverus, he was at first the missionary to the Penobscot and Passamaquoddy Indians in Maine, but was brought back to Boston permanently in the fall of 1799. As the Catholic Church in Boston expanded under the leadership of Fathers Cheverus and Matignon, the congregation outgrew its space on School Street and a new Church of the Holy Cross was built on Franklin Street between 1799 and 1803. Boston was made a diocese in 1808, and Father Cheverus was appointed Bishop of Boston, although he was not ordained until November 1, 1810. In 1823, Bishop Cheverus was summoned back to France by the King to become the Bishop of Montauban. The people of Boston were inconsolable at the loss of the popular bishop, and the account of his parting has been widely reprinted. Only three years later, Cheverus was named Archbishop of Bordeaux, after which Charles X made him a peer of France and a blue ribbon commander of the order of the Saint-Esprit. King Louis Philippe requested that the Pope elevate him to the College of Cardinals, and Cheverus was made a Cardinal on February 1, 1836. He died only five months later, on July 19, 1836. The Roman Catholic Church of Boston was established in 1788, prior to the arrival of Matignon, and suffered under the influence of a weak and disreputable clergy. The climate towards Catholics in Boston, therefore, was one of intolerance, if not outright hostility, and Cheverus is still remembered for his success in easing the tensions between the incoming Catholic population and the older Protestant stock. In fact, his relationship with the Athenæum was the result of an effort to dispel the longstanding prejudices of his adopted home. The February 1807 edition of the Monthly Anthology included one of a series of letters entitled “Original Letters from an American Traveller in Europe to his Friends in this Country.” The letter began by assuring the reader that the author had few religious prejudices, but that it was his duty as a man and a Christian to examine and expose the absurdities of the Roman Catholic religion. The writer ridiculed what he deemed to be the errors and superstitions of Catholic doctrines, including the selling of indulgences, which he equated to the granting of permission to commit crimes. Despite this thorny start, the relationship between the founders of the Boston Athenæum and the first Roman Catholic Bishop of Boston flourished. Athenæum Trustees and Proprietors such as John Quincy Adams, John Lowell, Harrison Gray Otis, and Josiah Quincy considered the French priest a friend, would go hear him preach, and contributed to the construction of the Church of the Holy Cross. Although the priest was not a Proprietor, anecdotal evidence suggests that Cheverus enjoyed reading the latest papers from France at the Anthology Club, whose rooms were not far from the rectory. Most notably, the Bishop gave more books to the Athenæum in its early years than any other single man except John Lowell, first treasurer of the Library. From March 1810 until he left Boston in September 1823, Cheverus donated 82 titles to the Library. The oldest book in the Bishop Cheverus Collection of gifts originally belonged to Father Matignon. When his beloved colleague died in September 1818, Bishop Cheverus gave Matignon’s Hebrew Psalter to Reverend William Bentley, Pastor of East Church in Salem, a close friend of both men. Pasted behind the last page of the index are the following words: “Extract of a Letter from the Bishop of Boston to W.B. of Salem, Oct. 20. 1818 – my late venerable friend Dr. Matignon animæ dimidium meæ, has expressed to me his grateful sense of your kind hospitality & I have seen that you cherish his memory. For his sake I beg you to except this small hebrew psalter. From page 269 to p.284 it is the handwriting of the dear Dr., as well as the index. It is equal to the type & much more precious. I am sure you will be glad of the loss of the leaves which have been so well replaced.” A fragment of Bentley’s response was transferred from the volume to the Athenæum’s manuscript collection. Dated October 21, 1818, it reads, “Should duty, or any other cause induce the Bishop of Boston to visit Salem, my house, my friends, my heart is ready for him. The memorial of the Dr. M. is beyond all value. The talent in it is great, & the best care, I have, shall preserve it.” When Dr. Bentley died one year later, on December 29, 1819, the psalter appears to have been returned to Cheverus and subsequently given to the Athenæum. The Hebrew psalter itself was printed by Robert Estienne and published by Robert Stephens in Paris in 1565. It has a French seventeenth- or eighteenth-century binding in red straight-grained goat skin with gold tooling. The edges were originally colored yellow. Once the Library acquired the volume, “Boston Athenæum” was stamped on the cover and the call number was stamped on the spine. 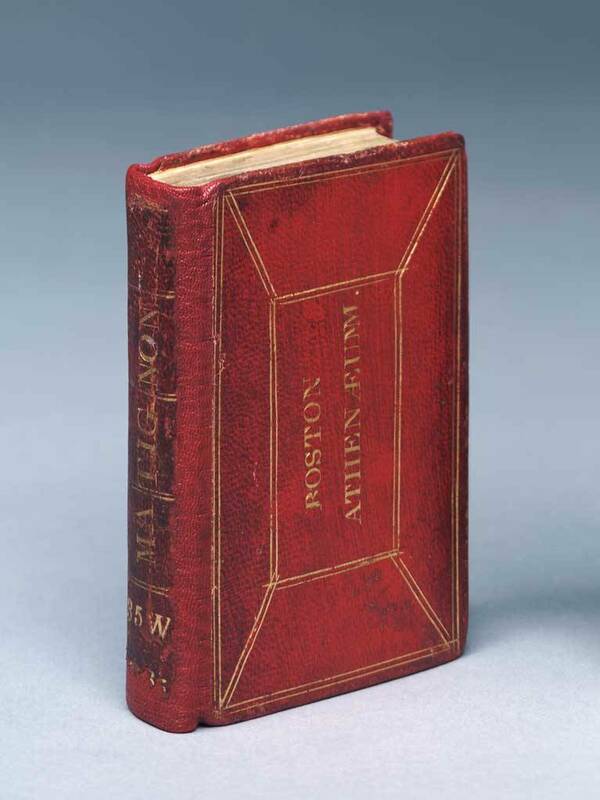 The name “Matignon” on the spine precedes the Athenæum’s ownership. The Library has no information about the book’s provenance prior to Father Matignon, although the first page is signed “De La Roche Lambert.” A manuscript index in Latin and pages 269-284 in Hebrew were handwritten by Matignon. Although at first glance it is difficult to tell the difference between the printed type and Matignon’s Hebrew lettering, upon further inspection one notices the rare mistake that is crossed out on those pages. While this psalter is certainly not the most rare or finely bound book in the exhibition, it was chosen because it is an interesting representative of the diverse collection donated by Bishop Cheverus, and because of its personal connection to two close friends of the bishop who were well-respected men of their day. In addition to the large collection of books donated by Bishop Cheverus, the Library has also acquired related material over the years. The Print Department houses a handful of lithographs after the Gilbert Stuart portrait of Bishop Cheverus, now owned by the Museum of Fine Arts, Boston. The most impressive is a large lithograph printed by T. Moore’s Lithography in Boston about 1836, probably in memoriam of Cheverus. There is also a carte de visite from the 1860s bearing the bishop’s likeness. Among the rare books is a copy of the sermon delivered at the consecration of the first bishop of Boston and a number of biographies, including an 1839 translation of the first Cheverus biography published in French in 1837, written by his colleague André Jean Marie Hamon. The Library also owns a book inscribed “J. Lefebvre pbr 1807,” donated by Rev. W.H. Van Allen in 1926. Nicole Leonard, from, Stanley Ellis Cushing and David B. Dearinger, eds., Acquired Tastes: 200 Years of Collecting for the Boston Athenæum (2006): 78-81. Copyright © The Boston Athenæum. Annabelle M. Melville, Jean Lefebvre de Cheverus, 1768-1836 (Milwaukee: Bruce Publishing Co.,1958), 2, 4, 10-11, 18-24, 43, 57. Ibid, 88, 114, 253-436. The most often reprinted account of his departure is Samuel L. Knapp, “Memoir of Bishop Cheverus,” Boston Monthly Magazine 1 (June 1825). The Reverend Robert H. Lord, “Jean Lefebvre de Cheverus, First Catholic Bishop of Boston Massachusetts,” Massachusetts Historical Society Proceedings 65 (October 1932-May 1936): 75. “Original Letters from an American Traveller in Europe to his Friends in this country – Letter Second – Rome, Nov. 16, 1804,” Monthly Anthology and Boston Review 4 (February 1807): 71. “To the American Traveller, on his second letter, published in the Anthology, vol. 4, page 71, Boston, April 7, 1807,” Monthly Anthology and Boston Review 4 (April 1807): 187-190. Massachusetts Historical Society Proceedings, 65, 71. Melville, Cheverus, 207. It is difficult to confirm his use of the Library, since the Athenæum’s readership records do not go back that far. Athenæum Centenary (1907), 75-76. Only large gifts are included, so his smaller gifts may not be counted among these volumes. Walter Muir Whitehill, A Memorial to Bishop Cheverus, with a Catalogue of the Books Given by Him to the Boston Athenæum (Boston: The Boston Athenæum, 1951), 1-9. Some confusion surrounds the records of the Cheverus collection. Whitehill lists 71 titles in his catalogue; however, 8 additional titles donated by Cheverus were identified in 1973. (See Boston Athenæum Reports for 1973, 11-12). The author counted a total of 81 titles donated by Cheverus in Boston Athenæum Donations, April 1807-July 1938 and discovered one title not accounted for because it was bound with another book. Also, both A Memorial to Bishop Cheverus and Reports for 1973 incorrectly list at least one title attribution and a number of acquisition dates. William Bentley to John Cheverus, October 21, 1818, BA manuscript collection.